The Dixie Horseman’s Association (DHA) is a non-profit corporation based in Cross City, Florida since 1992 that holds many rodeos, roping’s, pageant and other community events at the Cross City Rodeo Arena. Youth of all ages participate in these events. The current president of the DHA shared the need to adopt a tobacco free venue policy to help assist with the need to promote family, health and sports. Tobacco Free events and venues help reduce the social acceptability of tobacco use. Based on the 2018 Florida Youth Tobacco Survey, 13.5% of Dixie County Youth (11-17) report to be current users of smokeless tobacco and 31.1% of Dixie County Youth currently use some form of tobacco. The social acceptance of tobacco use begins at a young age. Studies show that youth are influenced by tobacco use in sports. By addressing the tobacco use at the rodeo arena, the social norm between tobacco use and rodeos can be removed in Dixie County. Proposed signage to promote the new tobacco-free policy. 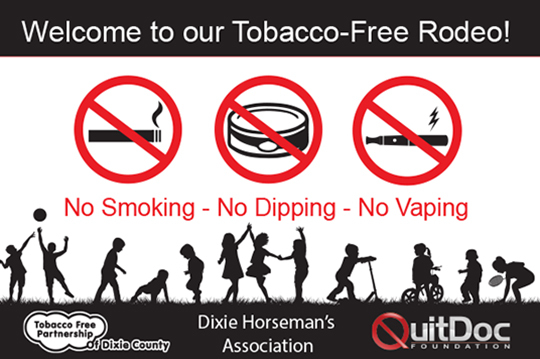 The DHA and the Tobacco Free Partnership of Dixie County are working on a policy to establish a tobacco-free environment for Dixie Horseman’s Rodeo Arena. Any organized activity that is used in the planning, operating or organizing the event. Included activities related to the scheduled event itself as well as set-up and take-down. The entire physical area in which the event is being staged and over which the organizers has control or responsibility. The venue site includes all open, semi-open, and enclosed spaces and structures, including for example parking lots, loading docks, exhibit halls or vendor booths, conference rooms, dining areas, bathrooms, performance stages, sports or other recreational areas or facilities. 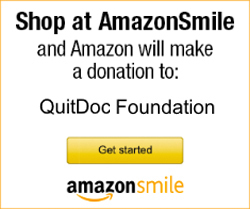 Any substance containing tobacco leaf, including but not limited to cigarettes, cigars, pipe tobacco, hookah tobacco, snuff, chewing tobacco, dipping tobacco, snus, electronic nicotine delivery systems (e-cigarettes, vaping, etc.) or any other preparation of tobacco. The DHA will not allow Tobacco to be used during an Event or at the Rodeo Arena. This policy applies at all times during the Event and to everyone attending the Events. The DHA will make sure that numerous easy-to-read posters or signs are posted prominently at the Event (including at entrances, exits, and other appropriate areas) to inform all attendees of the policy. The sign will indicate that Tobacco use is not permitted anywhere on the venue grounds. By creating a tobacco-free venue at the DHA Rodeo Arena, the Dixie County youth and parents will have more opportunities to attend tobacco free sports events to promote health, family and sports. If you would like to join the Tobacco Free Partnership of Dixie County as they promote more tobacco-free venues and events, contact Melanie Anderson, Tobacco Prevention Specialist at MAnderson@QuitDoc.com.